Ford has been selling it’s F-Series of full-size pickup trucks continuously since 1948. The all-American, made in the USA pickup truck has retained the title of the Best-Selling Vehicle in the United States for the past 32 years, and the title of Best-Selling Pick-Up Truck in the United States for 43 years. The F-150 model in the series was introduced to the American market in 1975, and has provided ranchers, government entities, and farmers with a work-horse, dependable truck ever since. The 2015 Ford F-150 marks the beginning of the pickup truck’s thirteenth generation, and was given a slew of updates for the new model year. In addition to an increase in fuel economy and decrease in overall body weight, the 2015 F-150 has been named the industry-best when it comes to towing and payload capacity. Ford's latest pickup outdoes all of the competition, including the 2015 Chevrolet Silverado. The F-150 is packed full of class-exclusive new technologies, further pulling ahead of other vehicles in its segment. Featuring a maximum payload capacity of 3,300 pounds, and an impressive 12,200-pound tow rating, the 2015 F-150 leads all other trucks in its class. Most impressive, is that the estimated towing and payload capacity numbers have been verified as compliant with the Society of Automotive Engineer’s J2807 standards. For those seeking the full 3,300 pound payload rating, drivers will need to opt for the F-150’s largest, 5.0-liter V8 engine. To take advantage of the class-leading 12,200-pound towing capacity, the 3.5-liter twin-turbocharged EcoBoost V6 is the correct engine choice. This engine gets an impressive 365 horsepower, and 420 lb.-ft. of torque, and truly delivers in all of the areas of performance that drivers of the F-150 has come to expect. The 2015 Ford F-150 does a lot more than flex its muscles. The full-size pickup truck also features ten groundbreaking features that are not only all-new to the F-150, but are class-exclusive. No other pickup truck on the road can offer what the 2015 F-150 can, and that alone is powerful. This technology utilizes two ultrasonic sensors and electric power steering to allow hands-free parallel parking. Once the F-150 measures the space and confirms that the space is adequate, drivers use the accelerator and brake pedals, while the truck automatically steers into the parking space. Also utilizes front radars and measures the speed and distance of vehicle’s ahead. The truck automatically slows to a speed that allows a consistent following distance that is set by the driver. Collision warning works by triggering audio and visual alerts if the following distance is closing-in too quickly. The brakes on the pickup are also pre-charged if the driver needs to stop quickly. This innovative system helps drivers who enter into a turn too quickly. The vehicle automatically reduces torque and applies the four-wheel braking system to reduce vehicle speed by up to 10 mph in just one second. This technology was developed by Ford engineers, and helps keep drivers on their intended path. When trailer lights go out, the F-150 will alert drivers regarding which light is out, without having to leave the truck. Multi-Contour Seats - After a hard day on the job, these massaging seats are the perfect solution for sore backs. Blind Spot Information System with Cross-Traffic Alert - Radar sensors monitor areas around the truck that the driver cannot visually see. They alert the driver if a vehicle is in the way for changing lanes, or backing out of a parking space. Lane-Keeping System - This automatic system alerts drivers when they veer out of their intended lane, without using turn signals. Hill Descent Control - By employing anti-lock brakes, this available technology can automatically set the truck’s speed with the push of a button. Individual Tire Pressure Monitoring System - Drivers can see air pressure amounts for each tire, and receive alerts when a tire is too low. 360-Degree Camera with Split-View Display - Four exterior cameras work to give the driver a bird’s-eye view of up to seven surrounding feet of the pickup truck. This technology works to assist in maneuvering in tight spots, parking, and going down narrow roads and trails at lower speeds. Aside from being the best-selling pickup truck and vehicle in America, having a long list of class-exclusive features under its belt, the 2015 Ford F-150 can stand up to any competition thrown it’s way. Compared to the comparably-equipped 2015 Chevrolet Silverado, the Ford F-150 still stands out as a clear choice. Check out the different areas the 2015 F-150 stays ahead of the stiffest competition. The F-150 was completely redesigned for 2015, whereas the 2015 Silverado did not can any major revisions since the 2014 model year. The base model of the 2015 F-150 offers a higher fuel economy than the 2015 Silverado base model. Optional engines on both trucks also follow the same trend, with the 2015 F-150 offering a better all-around fuel economy than the Chevrolet. Both pickup trucks offer the same level of standard safety features, but the F-150 offers more overall features such as a 360-degree camera, blind spot monitoring system, with inflatable seatbelts, and forward-collision warning with brake priming. None of the above equipment is even offered on the Silverado. 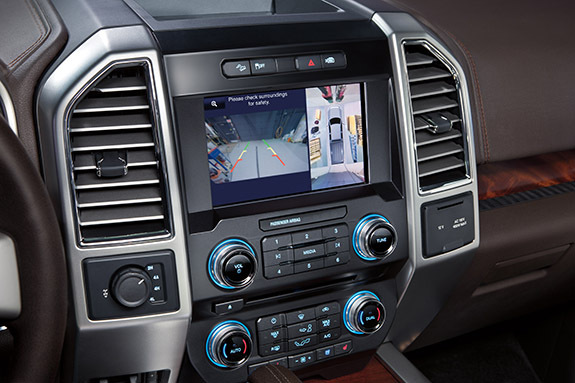 While the Silverado offers great high-tech features such as a rear-seat Blu-Ray player, MyLink infotainment system, and an 8-inch touchscreen display, the 2015 F-150 outperforms with even more advanced options. Automatic high-beam control, automatic parallel parking assist, adaptive cruise control, LED taillights and headlights, and power-retractable running boards are only a few of the options that the 2015 F-150 offers, that the Silverado does not. 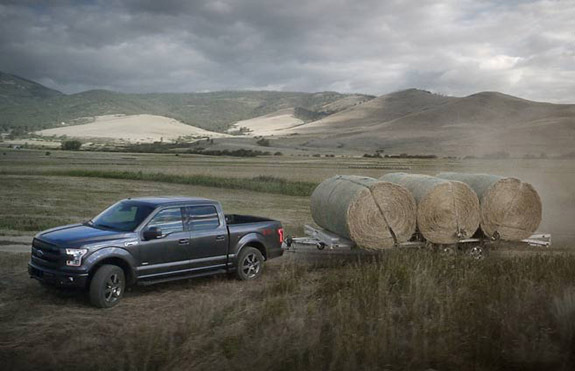 Each truck offers drivers different levels of engine options to choose from, but the 2015 Ford F-150 cannot be beat when it comes to payload and towing capacities. With best-in-class ratings for both of those numbers, the F-150 simply cannot be beat. The 2015 Silverado starts at an MSRP of $25,575, while the 2015 F-150 starts at $25,800. The slightly higher MSRP of the F-150 is accounted for in the number of standard features and upgrades that the Silverado does not and cannot offer drivers. For the most features for the best price, it is obvious that the 2015 Ford F-150 beats out even the toughest competition.